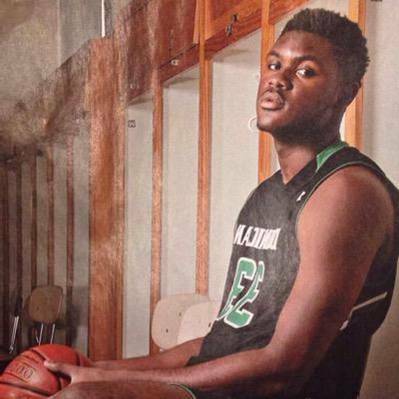 The announcement that Milwaukee-area high school basketball phenom Diamond Stone has committed to play at the University of Maryland next season is huge. In fact, everything about Stone is huge, beginning with his actual size. Most scouting services list him at 6-foot-10 and 250 pounds, although he tweeted earlier this year that he had been measured at seven feet tall. It’s also a huge “get” for Maryland and coach Mark Turgeon, who beat out Wisconsin, Connecticut and Oklahoma State, his other top choices. In truth, though, every big-time school in the country pursued him at one point, including Duke, UCLA and all the rest. They did so with good reason. Stone is a consensus top 10 player nationally and his ranking within the top 10 depends on which outlet (ESPN, Scout.com, etc.) you’re looking at. Stone is headed to Chicago for the McDonald’s-sponsored high school All-America game on Wednesday and becomes – aside from Melo Trimble – Maryland’s first McDonald’s All-American signee since sharpshooting guard Mike Jones in 2007. Considering his size, talent and potential, it seems unlikely that he’ll remain in College Park for four years, so here’s a crash course, including quotes, facts and figures about the young man who might be the program’s most celebrated signee since Albert King, almost 40 years ago. Stone averaged 24.6 points, 11.9 rebounds, three blocks and 1.4 assists per game for the Knights, who finished 25-3 this past season and won the school’s fourth straight state championship. Dominican blew out previously undefeated Mineral Point (27-1) in the 2014-15 state championship game. Stone had 23 points, 15 rebounds and two blocks. In the process, Stone’s school – Dominican High School of Whitefish Bay Wisc., just outside of Milwaukee, became just the second school in state history to win four straight titles. Stone ranks as the No. 4 prospect in the nation for the 2015 class, according to Scout.com. Rivals.com has him ranked sixth and ESPN seventh in the class. He comes from an athletic family. His father, Bob, played basketball at Wisconsin-Whitewater. His mom, Cynthia, played volleyball at Arkansas-Pine Bluff. Their daughter, Endia, played volleyball at Tennessee State. Stone’s cousin (the daughter of his mom’s sister) is Yolanda Ogunbowale, Wisconsin’s Gatorade Player of the Year who committed to play at Notre Dame. Stone’s father, Bob, has overseen much of his son’s early development, coaching him on various club teams through the years. He also encouraged his rapidly growing prodigy to pursue a variety of interest, including the drums (which helped developed his coordination because it require the use of both hands and both feet) and taekwondo (which helped with balance and footwork). The club team that Stone played for while being coached by his father was called The Young Legends. This year, he became just the 25th player in state history to surpass 2,000 points in his prep career. He had a 43-point, 18-rebound effort earlier this season and a 31-point, 11-rebound performance against traditional power St. Catherine’s of Racine, Wisc. in the sectional playoffs that included four 3-pointers.